These delicate plants require special care to make sure they thrive. This guide is about transplanting seedlings. The hardening off stage in a seedling's life cycle is one of the most precarious. When the calendar says it's time to transplant, tender young plants, which until now have been spared from drying winds, cold temperatures, strong sunlight and variations in moisture, must quickly adapt to life in the garden or suffer the consequences of transplant shock. Whether you've purchased seedlings from a greenhouse or grown your own from seed, here are some tips on preparing young plants for living a life outdoors. During the hardening off process, growth slows as the plants turn their attention to adapting to changing environmental conditions. During this pause in growth, the plant begins to accumulate and store the carbohydrates produced by photosynthesis. Once the plant has sufficiently adapted to its new growing conditions, it can readily tap into these stored carbohydrates and resume growing. The goal of hardening off plants is to minimize their shock to the change in conditions and shorten the delay in the resumption of growth. Start the process of hardening off about 2 weeks before you intend to plant the seedlings outdoors. Hardening them off for periods longer than 2 weeks won't really provide any additional benefits to the plants, and in some cases may even delay the resumption of growth. That said, if the weather turns bad or you have an unexpected emergency on transplanting day don't sweat it. Just extend the process until conditions are favorable and you can get the plants into the ground. Cold frames are a good way to transition your plants to the outdoors. Just remember to keep the cover/lid slightly ajar to ensure air circulation and avoid overheating tender plants. Gradually leave the cover open for longer periods of time. When you work up to a full day, you're ready to transplant. For gardeners not using cold frames, water your seedlings well and set them outdoors in a partially shaded spot. Leave the seedlings out for about an hour the first day. Repeat this process daily, slowly increasing the amount of time they are exposed to the elements. Once they can be left out overnight, they are ready to be transplanted. Cabbage, broccoli, and cauliflower transplants should not be exposed to cold temperatures for more than a few days, or the plants may begin to produce a seed stalk rather than the vegetative growth. If tomato transplants are exposed to temperatures of 50 to 60 degrees F for more than a week they may produce misshapen fruit later in the season. Vine crops such as cucumber, muskmelon, and watermelon may also be injured if exposed to chilling temperatures of 55 degrees F or lower. To help minimize shock, transplanting should be done on a cloudy day. If this isn't possible, at least wait until late afternoon when daytime temperatures begin to cool. Dig evenly spaced holes according to the recommended spacing. Fill the holes with water in order to saturate the soil. This should provide plants with enough moisture to hold them over for the first few days. 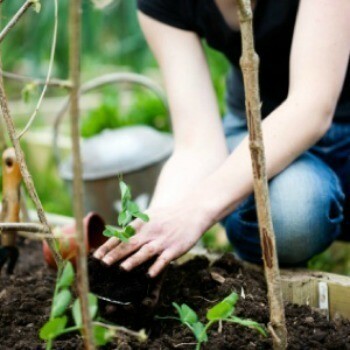 Set the plants into the ground as soon as the water has soaked into the surrounding soil. If the plants are in peat pots, plant the entire pot in the ground, making sure the rim of the pot is positioned slightly below the surface of the soil (otherwise the peat will act like a wick, transporting water away from your seedlings). If necessary, trim the rim of the peat pot carefully with a scissors so you can set the plant into the soil at the right height. Plants growing in plastic or clay containers need to be removed carefully to avoid injuring the roots. Fill in the hole and around the plant and press the soil gently to firm it around the roots. Don't press too hard. Compacted soil can seriously injure the roots and prevent the plant from recovering. As a final step, leave a slight depression at the base of the plant to collect all of the available moisture. Top dress with 1-2 inches of organic mulch. If their first full day in the ground after transplanting turns out to be an extremely warm one, provide the seedlings with some shade using newspaper cones, cheesecloth, or lattice propped up on its side. Remember, there's no rush to set your plants out. The calendar may say it's time, but nature may have other ideas. If your seedlings are frost-tender, be sure that all danger of frost has passed. 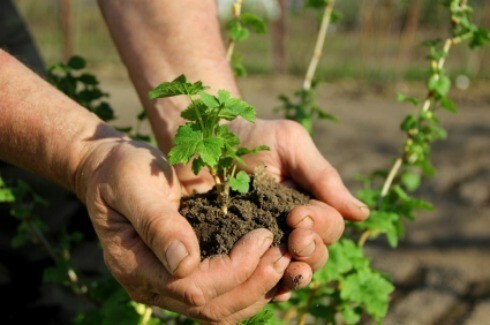 And don't forget to protect seedlings from animals throughout the hardening off process. Tips for transplanting seedlings. Post your ideas. I take the plastic soda bottles when empty and cut the bottom part of the bottle off, then I put it over my most tender, recently transplanted seedlings. By taking the top cap off, you have plenty of ventilation for your plant, but it protects them from many animals trying to eat them or dig them up. This year I decided to get over my fears of starting plants from seeds. In the past I had no luck transferring the seedlings outside so I decided to think like an adolescent plant. One thing I discovered is that if you transplant the seedlings on an overcast day in the late afternoon, gently soak the soil around them after planting, gently tamp around their base after soaking, they adjust much better to their new surroundings. They would rather not have you fussing around them in front of other plants but they need to know that you are there.